At Least the Ryder Cup takes your mind off of the rain! As I rose from bed this morning, the anticipation of starting our project again after a couple days off from rain was exciting. To my surprise, one of my contract guys text that he was coming in even though it was raining in Bridgeton. I looked out my window and saw a wet street. Checked the computer and found 2/10" of rain already recorded in the last hour. As I'm driving in I'm convincing myself that its not that much rain and we can work. Parking my truck and seeing our dirt pile glistening with mud, I knew we were finished again. 4/10" of rain today delayed us for the 3rd day in a row. The rain finally quit so we went out and rolled out 350 yards of big roll sod on the ground and another 4 pallets in the back parking lot to allow them to breath and cool off. We sent our contract laborers home and got busy doing things on the golf course to catch up with some of our detail work. The only good thing about the wet conditions was that I went home at quitting time and got to watch our boys battle the Euros in the Ryder Cup. Great playing and a beautiful golf course. Some sunshine this afternoon and a drying wind will allow the staff to get some work done tomorrow on #9 and Kye intends to do some work on #18. The forecast looks good so far next week so it will be some long days next week to catch up. We intend to move to the left side of #6 and left side of #4 and then on to #7. I would expect Kye will be on by Wednesday or Thursday. Our staff should get #18 complete by WednesdayThursday, one day each for #6 and #4. It was still too wet to do much work today on the bunker complexes. We did do some sodding on the left and right walk on areas of the 9th green today. The 9th green will be open on Friday and we plan on getting as much of it completed as possible. 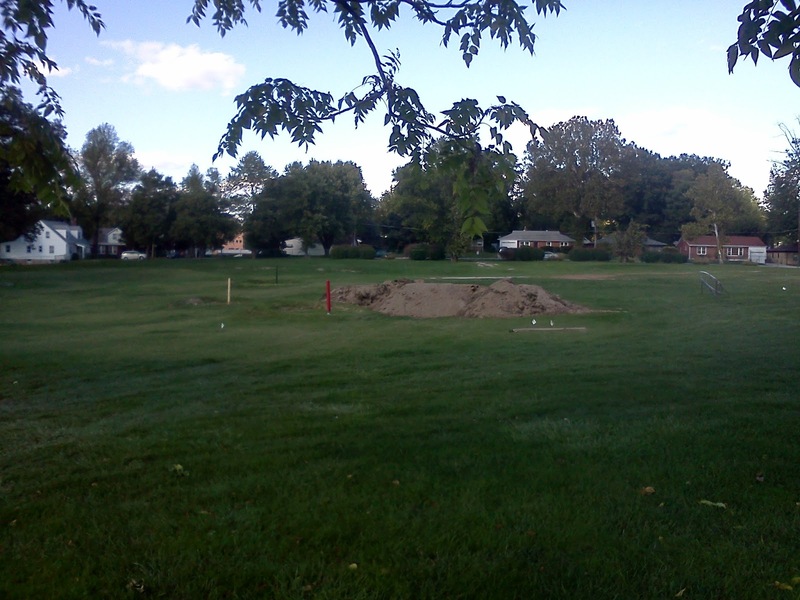 We will have the area roped off and please refrain from using roped areas to cut through to the 10th tee. Some areas are still wet and we have had trenches settle that will need to be back filled We will provide the safest openings to the green as possible but you might be forced to wall around instead of walking in a straight line to where you want to go. We appreciate your cooperation. 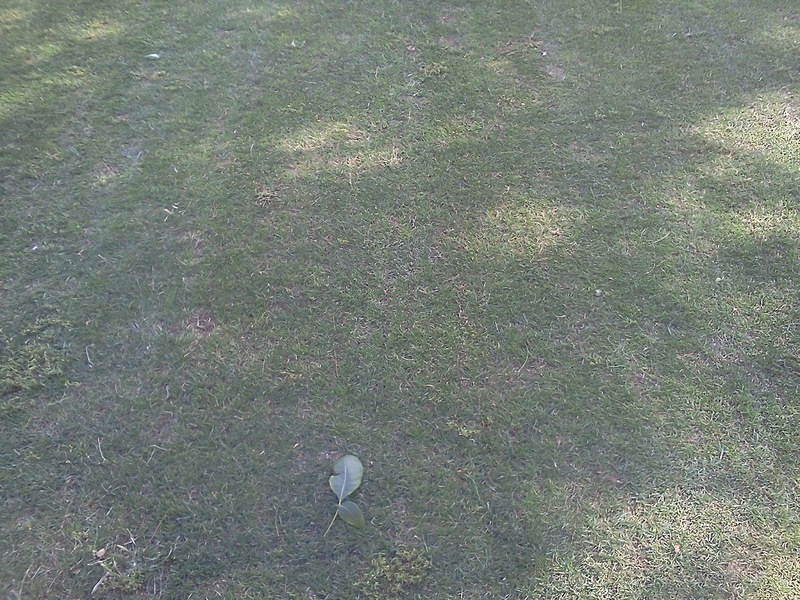 Interesting view of tree roots in greens. We were digging out the back left bunker on #9 when we came across some strange looking things coming out of the pea gravel layer of the green. 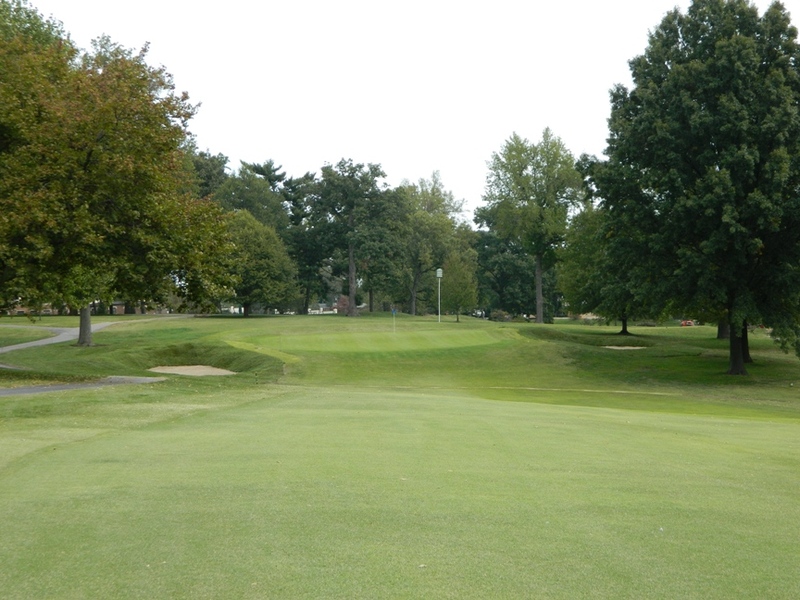 The 9th green is our only USGA spec green built on the property. 12" of sand, 4" pea gravel layer and drains trenched in the soil, floor of the green. I reached down about 15" below the surface of the green and grabbed a handful of tree roots that were each larger than my thumb. I know there were more than a couple of trees around 9 green in the past. 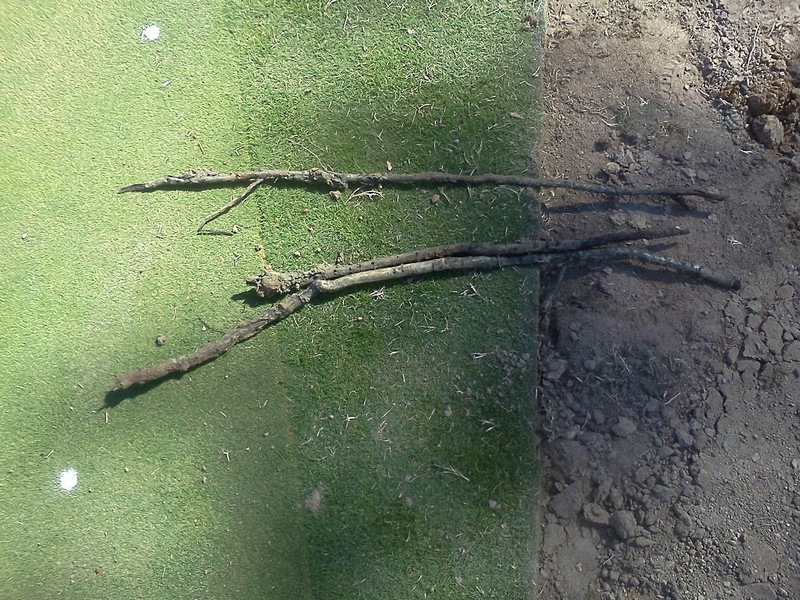 These roots had passed some time ago but it shows you the example of how they move into areas with the most water and can be very competitive with our bentgrass/poa annua greens. Bundle of roots pulled out of the gravel layer under the 9th green during Kye's excavation work. The roots pulled out of the green and lying out in the open. At least 30' from where any tree would have been located. 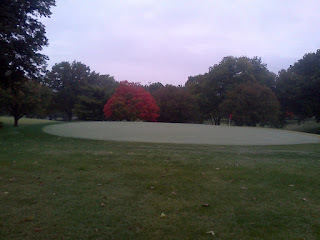 Nice color from a red maple beside #11. 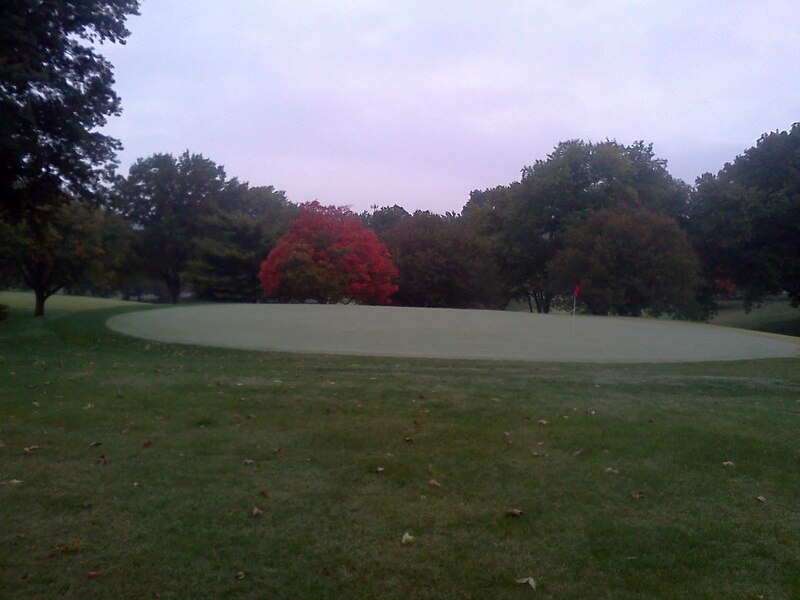 Maybe the rain in August will push some color out this fall while we rebuild the bunkers. Prayers must have worked. Only one round of rain here. We will get back in the bunkers 100% by Friday! The weather won today's round. 1.66" did some damage to our left bunker on #16. 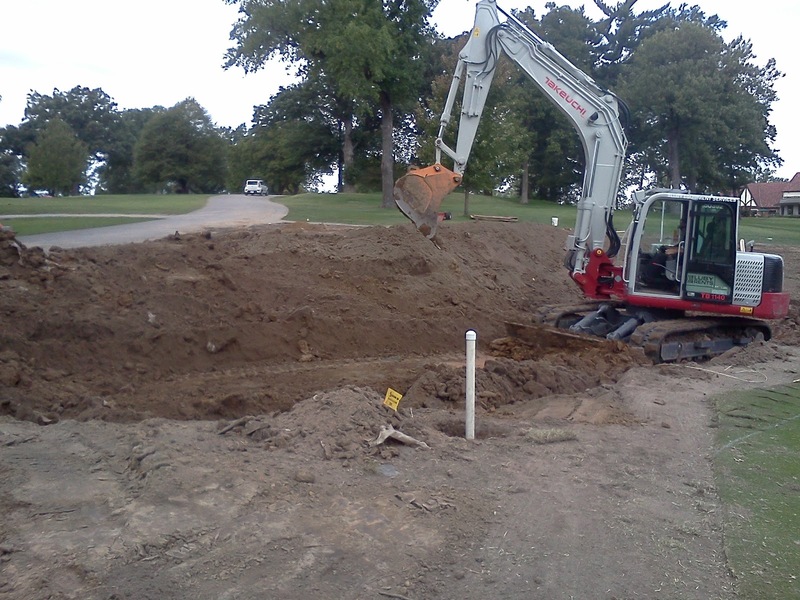 We will have to make a slight adjustment above the bunker to move the water around the bunker for the future. The mud will be scraped out and removed and new soil will be placed in the rut on the bank in the next couple of days when we can get out onto the area with doing additional damage. #9 had a small amount of mud wash onto the green but overall there was no damage to the right bunker that was completed that morning. 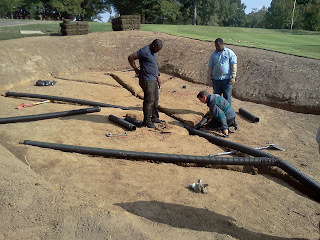 We had trenched the two left bunkers to insure that water could drain out of them and everything looks great. 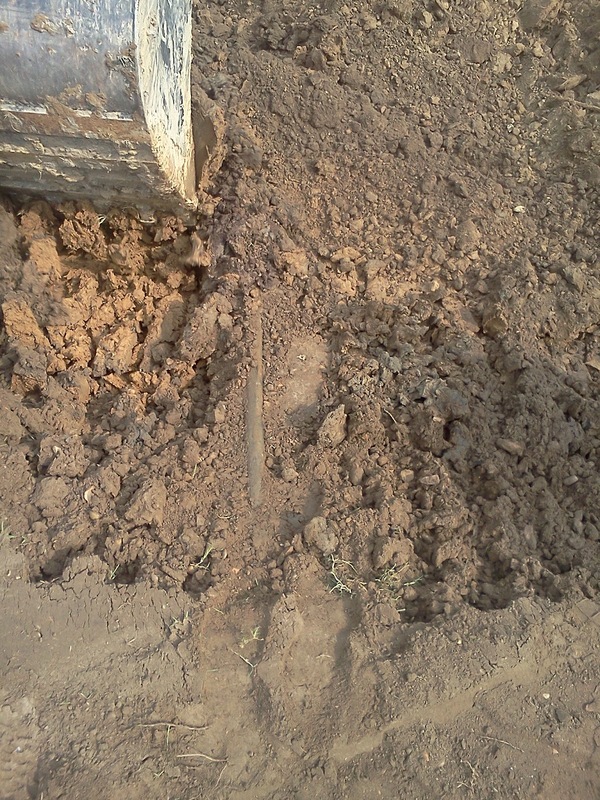 We have not been able to check out our trenches to see if they were full of mud. Below is a comparison of the before and after of #16! The old bunker complex above on #16. The new complex finished as of Friday on #16. I was already awake last night from Lady's late night visit outside, a stiff neck that made flipping from side to side difficult and then to top it off thunderbolts rang out. Lady and I moved to the living room couch and floor, not in that order in an effort to calm her fears from the lightning and a chance for me to find some way to get comfortable on a stack of pillows. As all of us do during a big project at work, my mind moved to the potential problems a thunderstorm might bring to our somewhat completed #9 hole. After a couple of hours sleep, my cellphone alarm went off and downstairs I went to check our rain accumulation in case I needed to cancel our contract workers for the day. I was relieved to see there was no rain accumulation and the radar was clear along Hwy 70. Thank goodness were weren't in north central Missouri where the rain was heavy. Kye began work on #18 this morning doing some initial work on the left front bunker and the left approach bunker. The approach bunker is ready for our staff once 9 is complete. Checking the gauge as I'm typing, we've only had .22" of rain(update that to .37") so far so maybe we will get lucky and keep the total really low tonight. 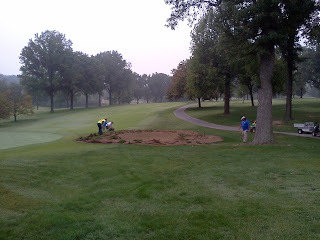 Our staff completed their work on the right bunker on #9. 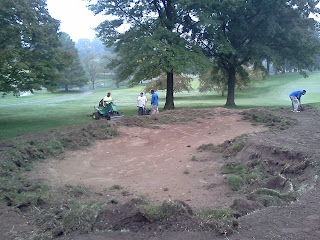 The remaining sand was added and sod now encircles the bunker. The staff also laid some additional sod on the right side of the green surround. 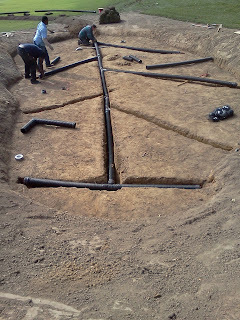 We were also able to get the left rear bunker trenched completely and we began to install the drainage when two lighting events brought us into the maintenance facility. We went out for a third time after all was clear again around 3:00 p.m. when a bolt out of nowhere flashed overhead and sent us racing back for cover to the maintenance facility for good. Mother nature gave us three chances and that was enough for me. Kye and I are discussing some potential changes in our renovation order based on the current piece of equipment we have rented. We are going to discuss a little further about moving to #6 and then to #7 since those bunkers are a little larger. The larger unit can remove spoils or dirt quicker but it cannot get into tight spaces as easily as the smaller unit we have requested from our rental vendor. If the rain allows us to work tomorrow, we should be close in getting #9 completed. I would expect that it will take us through Monday to get the three bunkers on #18 restored. Kye working Saturday afternoon behind #9. The hole cut between the two bunkers was made to allow our trencher to trench a line that will connect the two bunkers. The hole will be filled back in once the drainage has been installed. The same view but taken from the left corner of the lake. Up on top of the new mounding behind the bunkers. The new bunkers on #9 waiting for us to take over on Monday. 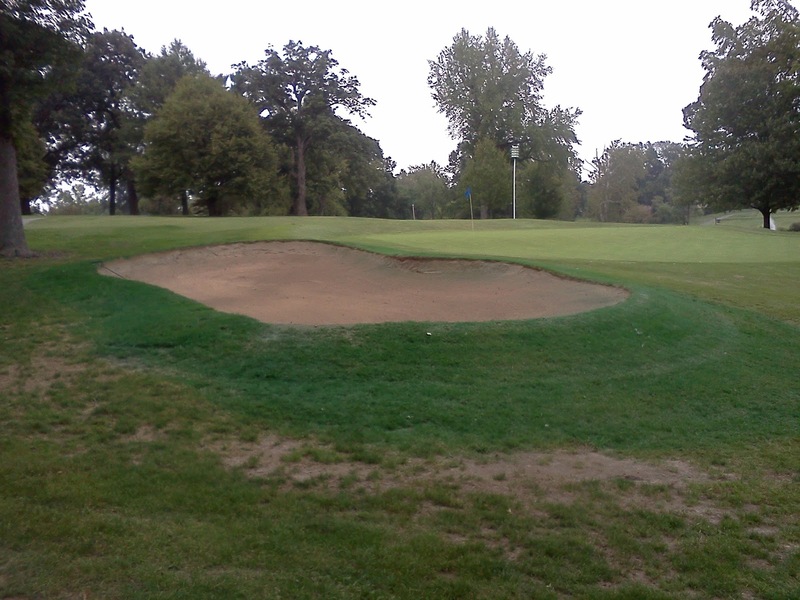 End of the day look on Monday with sod laid on the back along the cart trail, covering the slope on the right bunker that was drained and was partially filled with sand between the green and lake. 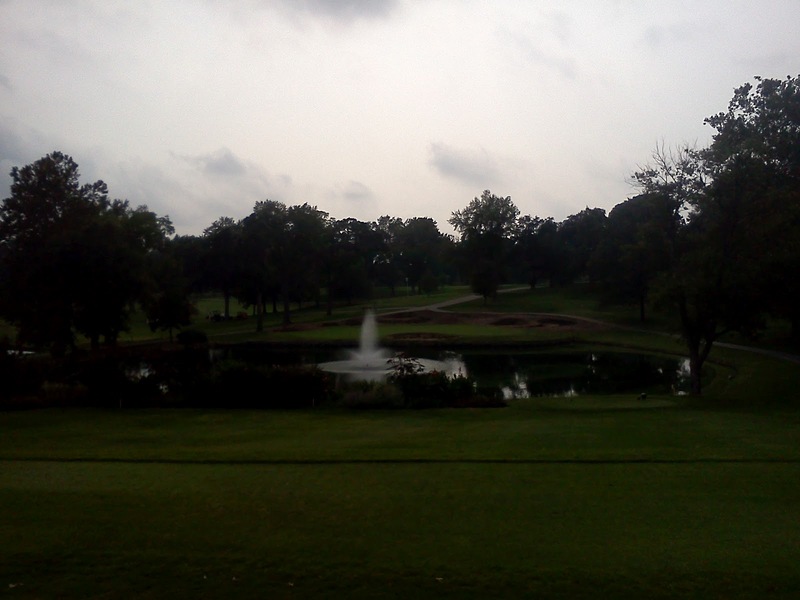 A view along the lake with the new sodded area replacing the front pot bunker. The view of the right side bunker partially completed on Monday. 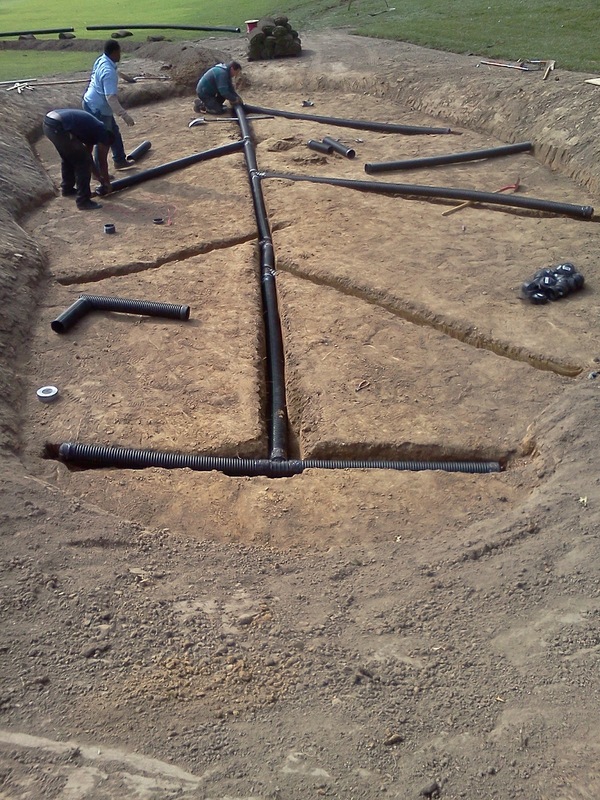 Drainage being installed in the left rear bunker on #9 on Tuesday between lightning events. The right rear bunker completed Tuesday morning on #9. Big roles of fescue on the right side of #9 green complex on Tuesday being laid. End of the day on Tuesday. A nice look with more sod behind the green waiting to be laid. Kye working on # 18 approach bunker on the left. We removed a load of sandy material and two loads of dirt. The dirt was dumped into the left rear of the left green side bunker. Additional shaping of the left approach bunker. 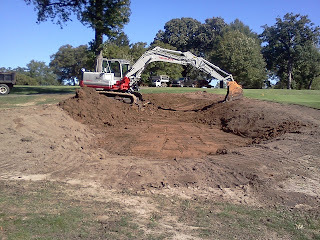 Initial work on the left green side bunker. Still more work to come. The look of #18 two left bunkers as they are being renovated. I will post additional pictures tomorrow if the rain comes as predicted. It was a long day with the staff working through 5 p.m. today. #9 has really been a massive undertaking with the changes that have been made. Kye worked all Saturday shaping the substantial area around the green in preparation for our work today. 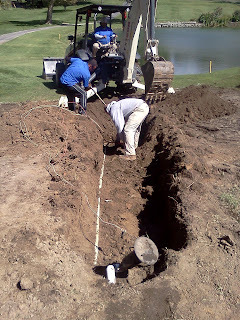 The staff had to replace about 70% of the irrigation around the green because of the changes in the bunkers in which the old line would have been hit by the excavation of the new right rear bunker. I ordered a tractor trailer load of sod, 1,200 yards and we laid about 600 before we had to stop. The right bunker was trenched, drained and sand was placed in the bunker but additional sand must be added tomorrow as well as the front and sides. We will have to trench to the two left hand bunkers and install the drainage as well as sod the banks and the remaining area around the green. If the rain holds off, we can complete it by the end of the day on Tuesday with some luck. If not, it will be Wednesday, Thursday or Friday depending upon the rain. Kye hopes to begin on #18 on Tuesday and I expect he might have two days work. In the meantime, we will need to work ahead of Kye and strip off #8. I was going to delay #6 to see how our expenses line up in case we can do the cart path change but have decided to go ahead and get the left side bunkers completed. This area can be very wet and I am concerned if I push it back too far it will be a real pain. The front left bunker is to be removed and we will work on it as well. I will save the two right hand bunkers for later since they are on the cart path and can be worked on in wet conditions. We will still hold out hope of removing the path and installing a new one to the left side of the green. 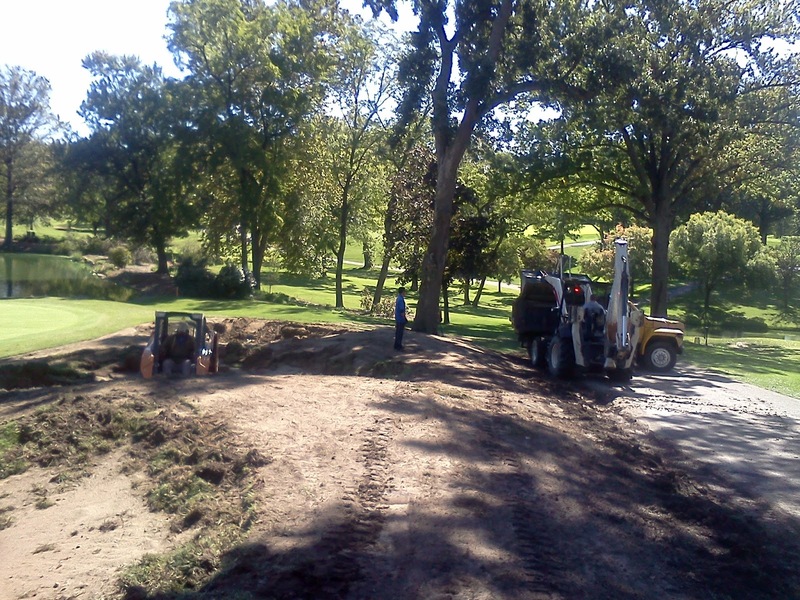 Sod in front of #9, some in the back and around the back of #9 right side bunker. Day 5, Bunker Renovation Project #16 IS FINISHED!! Day 5 brought the fear of some rain but none materialized. The staff finished off the right bunker on #16 and tackled the left bunker for the rest of the day and Skip led a crew at the same time removing sand and sod from around the two left hand bunkers on #18. 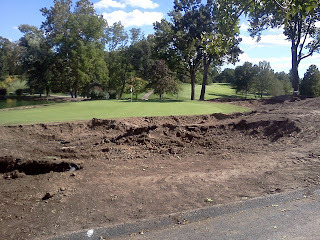 Kye made great progress on #9 and expects to be near completion on his part of the work Saturday. Our regular staff is doing their regular weekend duties and will be going home to a well deserved rest until Monday. I still have sod the outlet drain line from the left hand bunker across 16 fairway today and a short run on #16 right hand outlet drain but everything is complete. Remember, all new sodded and bunker areas are ground under repair until we take down the ropes and stakes. The sod needs some time to root and the soil needs some time to become firm I would expect the holes will be opened about 3 weeks after they are completed depending up our weather situation and how the ground has firmed up around the bunkers. Your cooperation is greatly appreciated. Rain is in the forecast next week over three days so get out and do your no rain dances for us! Kye will begin on #18 Tuesday due to an outing taking place on Monday. Our staff will be working on #9 laying a tractor trailer load of sod on Monday with more to come on Tuesday after installing the bunkers. I would expect our work to take about 2-2 1/2 days for #9. Kye added a third bunker to #9 which he flet would help the hole look a little more balanced than just two bunkers across the back. The green has been reduced down until next fall when we will add about 10-15' toward the lake from the right corner across the front and tie into the left front corner. This will give us a middle front hole location and will also bring the right front hole location closer to the water. As some of you might have seen over the last couple of days, we have a large number of people working within and around a bunker at one time. Their is a lot of digging, shoveling and more shoveling, sod laying and other back breaking work that occurs during this process. As Kye begins to move out ahead of us and our staff becomes more experienced in their work and we figure out additional ways to be efficient, you will see small groups working different jobs. Yesterday, we had three different crews in three different bunkers. Our staff also increases by mid-day as a few of our regular guys come off the golf course after completing their work to keep the course in good shape for you and your guests. Our pace is good right now. Work is near target and I think 16 looks outstanding. Kye digging out the back left bunker on #9. 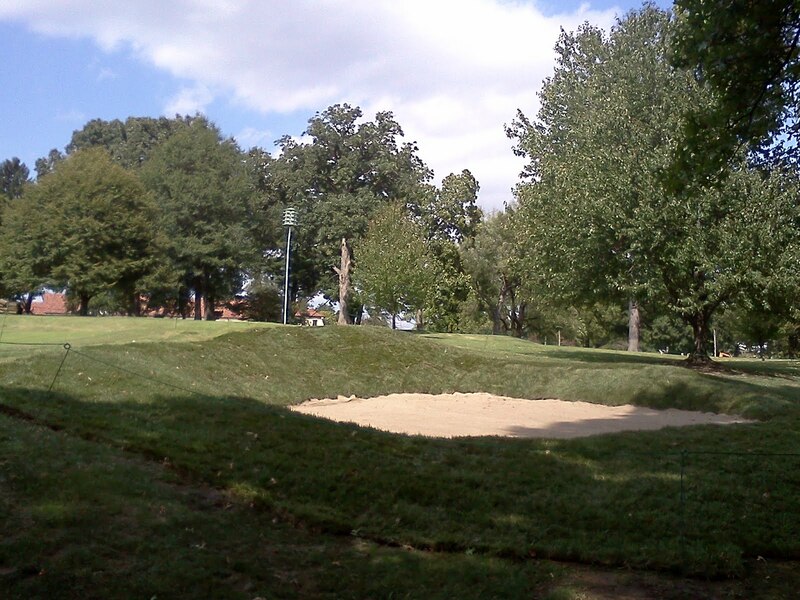 The front left bunker #9. 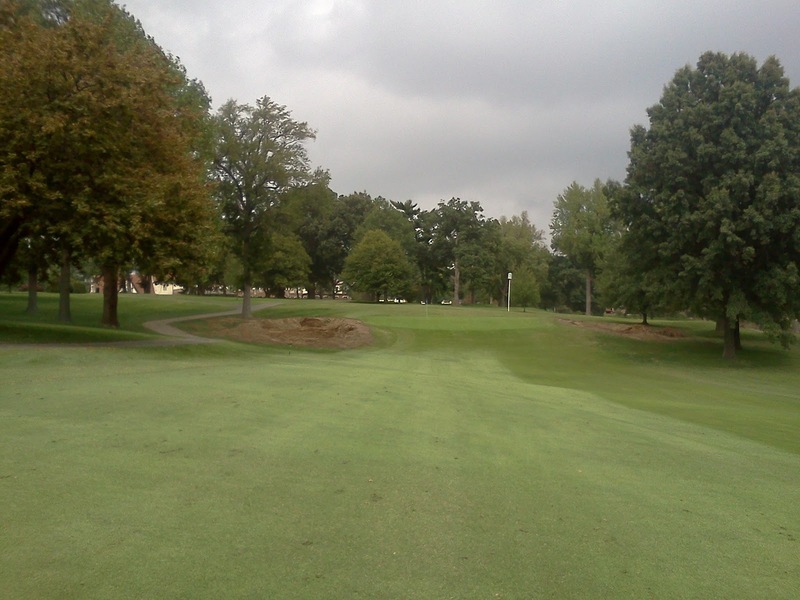 Looking from the back middle to the right side of the green. The new bunker on the right. Looking the other direct at the front right bunker. A view from the tee. Not completed but beginning to take shape. A little more distant view. 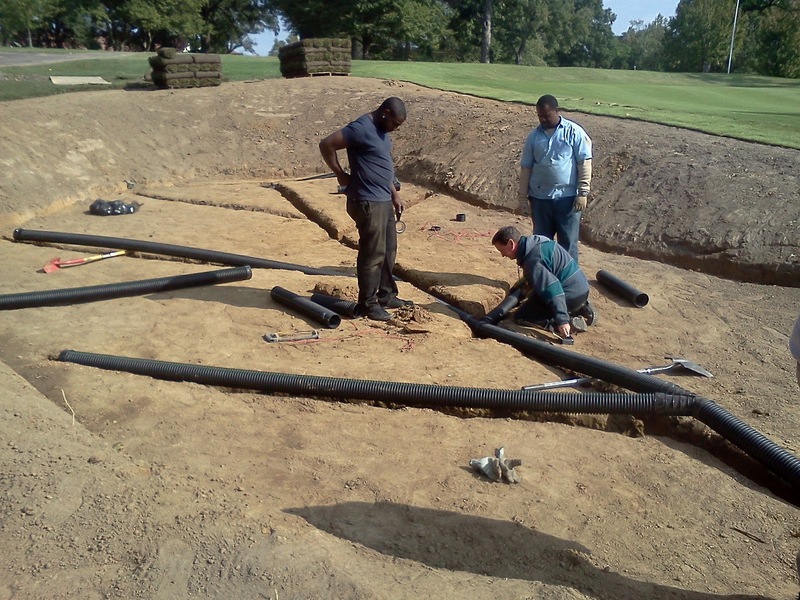 Russ installing drain pipe in the left side #16 bunker. Looking down on the same work. The right hand bunker #16 complete looking up the fairway. The left hand bunker complete looking up the faiway. Sorry about the picture. I will get a better one today. First Bunker, 16 right bunker completed! First bunker complete. 2nd bunker on 16 will be finished this afternoon. Sorry for a short report but the staff were working up to the time of our monthly board meetings. The right bunker on #16 is almost complete. A little more sod and some additional sand. 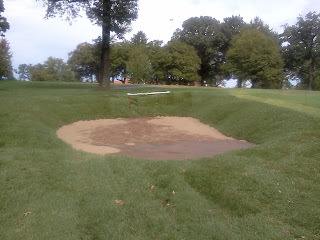 The left bunker needs the drainage installed, some additional sodding and sand installed. If the rain holds off we should have 16 completed by noon. I will have a more detailed report tomorrow. Kye began work on #9 before noon. Day 3 arrived with Kye Goalby beginning to do the design/shaping work on #16 bunkers. The left bunker's soil was full of moisture making it difficult to smooth and for it to pack. There are a couple of more hours work on shaping of #16 and he will then move on to #9 which will take him about two days to get shaped. We plan to trench and install drainage, spray the polyurethane liner onto the floor of the bunker and then install the sand and sod throughout the day on Thursday and should finish by Friday. 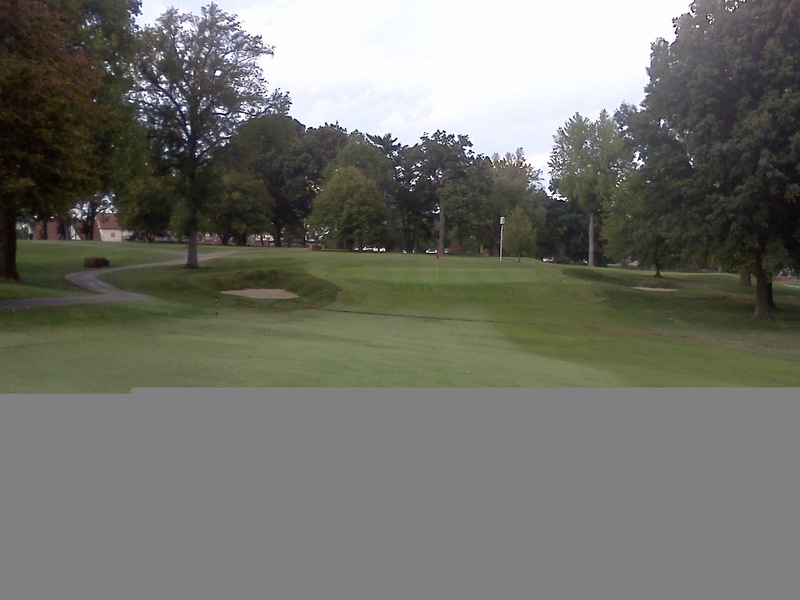 We will be reducing the back right half of the green around to the right front side by approximately 12'. 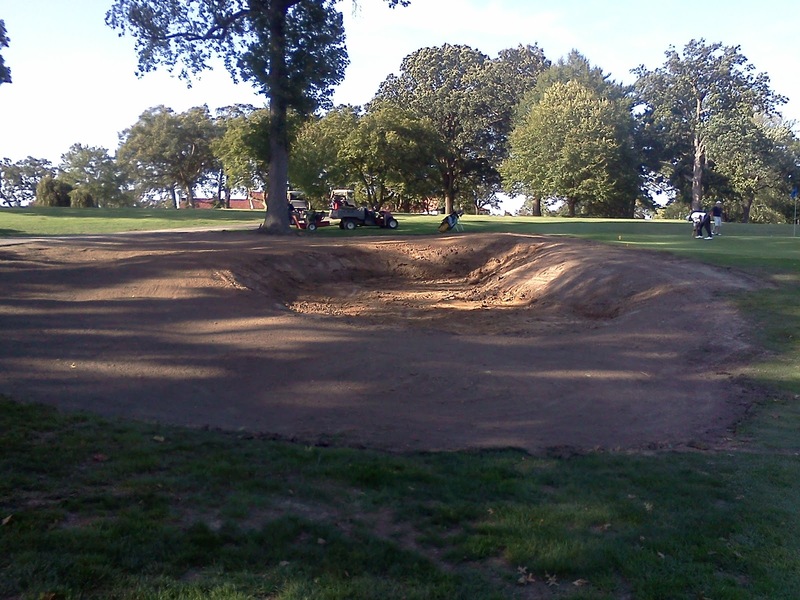 We will fill in the front bunker until next fall when we will expand the front middle of the green toward the water giving us a front hole location. Kye will work Thursday and Friday on #9. I would expect that we will be able to do some work on #9 by mid-day Friday/Saturday and part of the day before the tournament on Monday. We will complete 9 by late Tuesday or Wednesday. We have to relocate 4 heads and bring them into the edge of the newly shaped green. 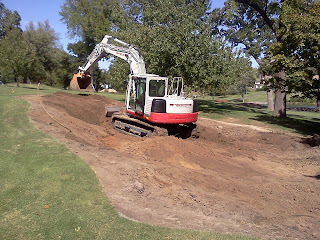 When Kye digs out the small section of green, we will have to adjust the green drainage pipe as needed. The staff began to remove the sod around the bunkers as well as digging out the old sand. This will continue throughout the day on Thursday and possibly some work on Friday. Kye should begin #18's work on Saturday or Monday depending upon upcoming weather on Friday. 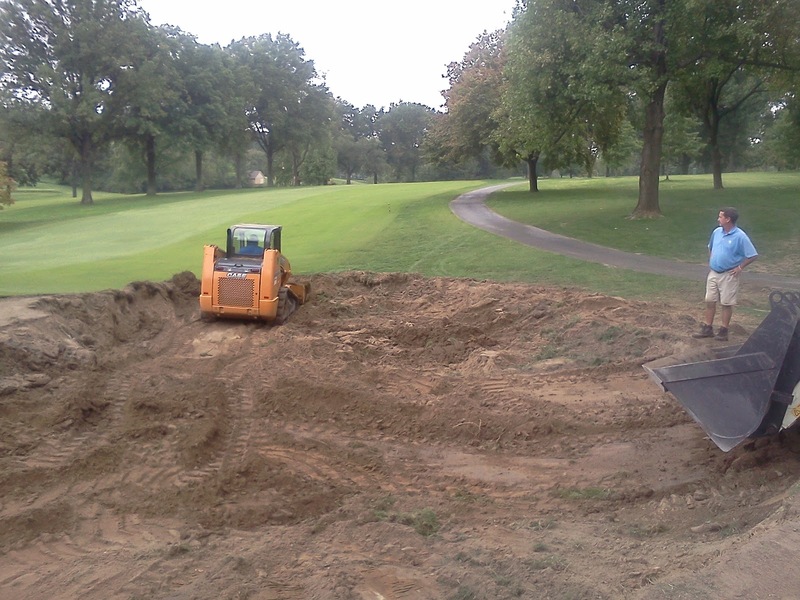 It should take him two days on #18 and will take us about three days to complete the install of the new bunkers. #16 bunker beginning to take shape. 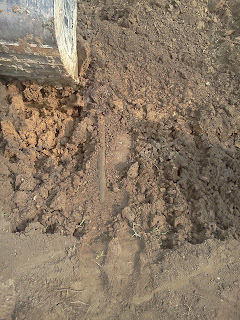 We might have to remove some soil on top which is not firming up and is excessively wet. 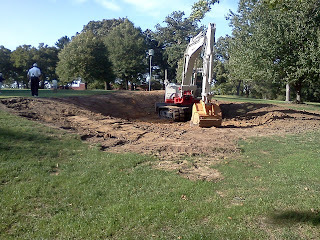 The soil will have to be removed and new soil is hauled back into the spot. 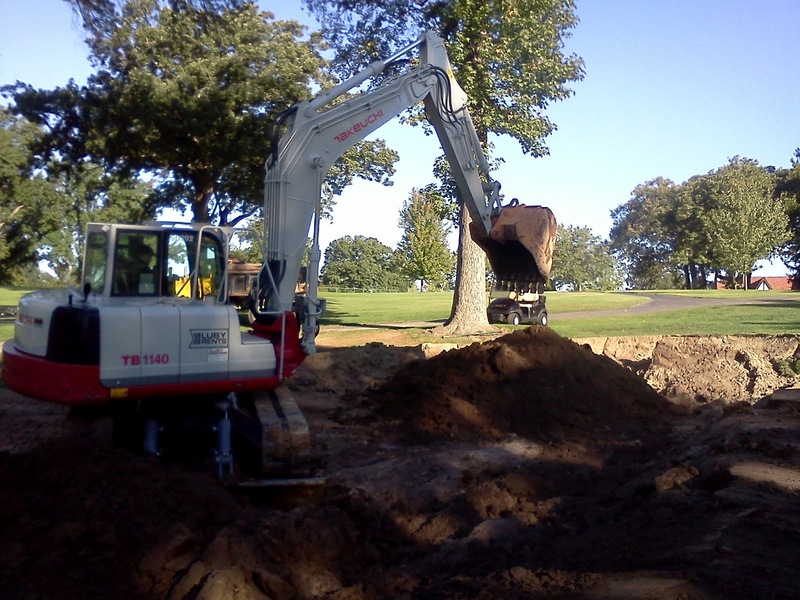 Kye shaping the right bunker #16. The view from above the bunker near the back of the green. 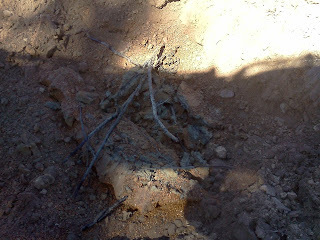 Notice the old metal irrigation line that we had to cut out. The left bunker still has some work to be completed but is near completion . The right bunker is well past 50% complete. The view of the 9th green. You can see the outline of the paint in the left side of the green. This is the new collar/border of the green. 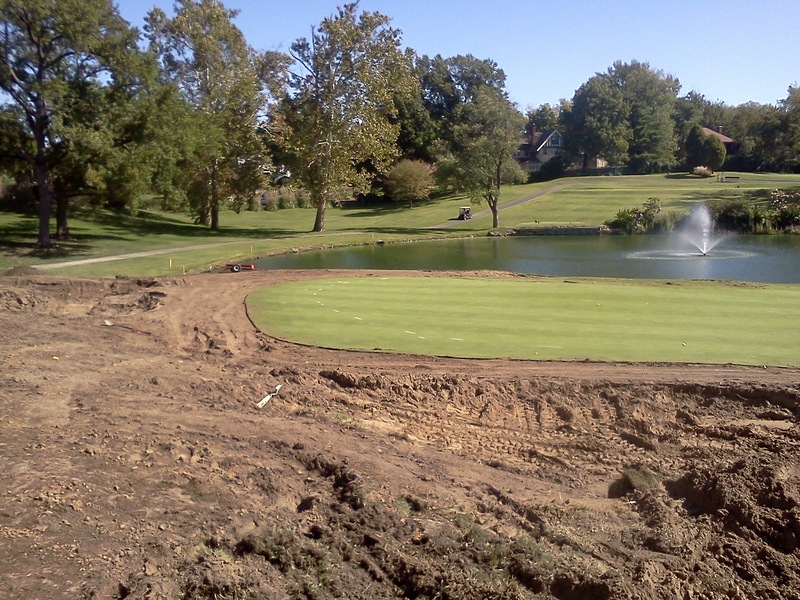 The size of the green will be reduced by approximately 500 sq/ft. Kye Goalby's work was delayed today because of the right from last night. We have had a great day of drying and he plan's to begin on Wednesday. We expect him to complete 16 on Wednesday and will move on to #9 on Thursday. Rain is in the forecast for Friday but we hope it will hold off until his work is completed. We expect to begin installation after he completes his first bunker sometime tomorrow and hope to complete #16 on Thursday including the sod work if all goes well. We possibly will remove sod and sand from another hole on Friday but this is all weather dependent. 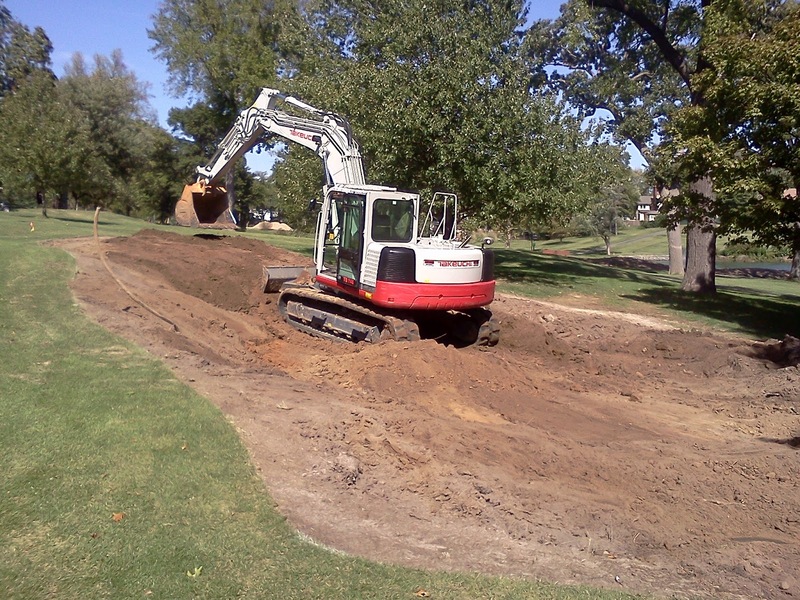 Skip removing sand from the left side bunkers. Jason receives the material from Skip and then dumps into the two dump trucks we are using on the project. Tom is waiting to haul away the material. Some of the spoils are being used to build a mound at the top of the long range to help keep the long drivers golf balls from going into the brush and trees. We will smooth the mounds and expect the bermuda grass to over-run the new mound. 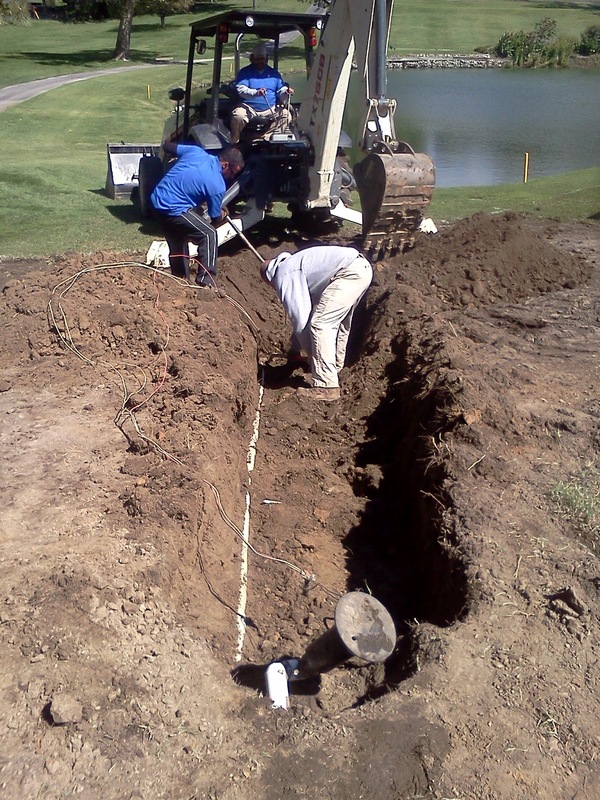 Skip exposing an irrigation line that must be removed because the head is on top of a mound on the back right corner of the green. Once Kye does the shaping, we will trench the line back in place. Looking from the back right corner of the green bunker complex. 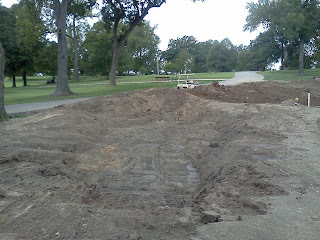 Sand has been removed and waiting for Kye's shaping work on Thursday. You will begin to notice piles of sand on the short range target area. We will be establishing three target greens on the short range to give a more realistic practice area. We tentatively plan to establish greens at about 35 yards, 70 yards and around 100 yards. The staff slit seeded the cool season tees today with ryegrass. The tees include #2, 3, 5,and 10. We used a light drag and then mowed the tees to smooth them and remove the thatch material that was brought up during the work. I would expect the new seedlings will be visible in the next couple of weeks. #10 tee which was slit seeded today. Let's Get It Started! The work went well today between some light showers. A good down burst occurred after the staff had left for the day and completed their work. I will attempt to post a tentative schedule at the beginning of each week and will also have it posted on the Echo Brief. This weeks tentative bunker restoration schedule. Remove sand and drainage pipe from #9. 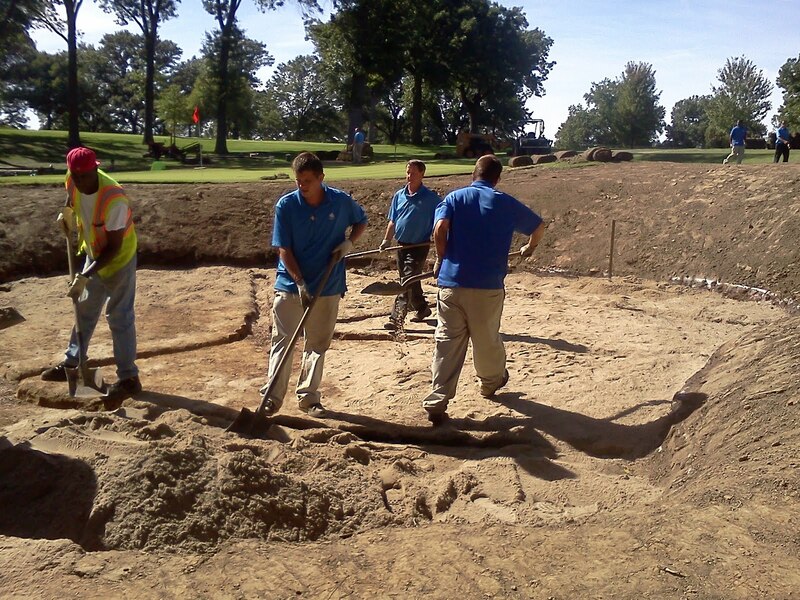 Staff begins installation of new #16 bunkers. Kye begins #9 and completes. #16 left bunker with the dye used to mark the spray pattern of the RoundUp. We will make this spary rather obvious. 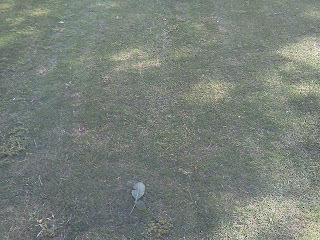 We will water it after about 24 hours or so to help reduce the chance that foot traffic can track it onto the greens. #16 left side with the staff using the sod cutter to remove the sod around the green. Same thing around the right bunker on #16. 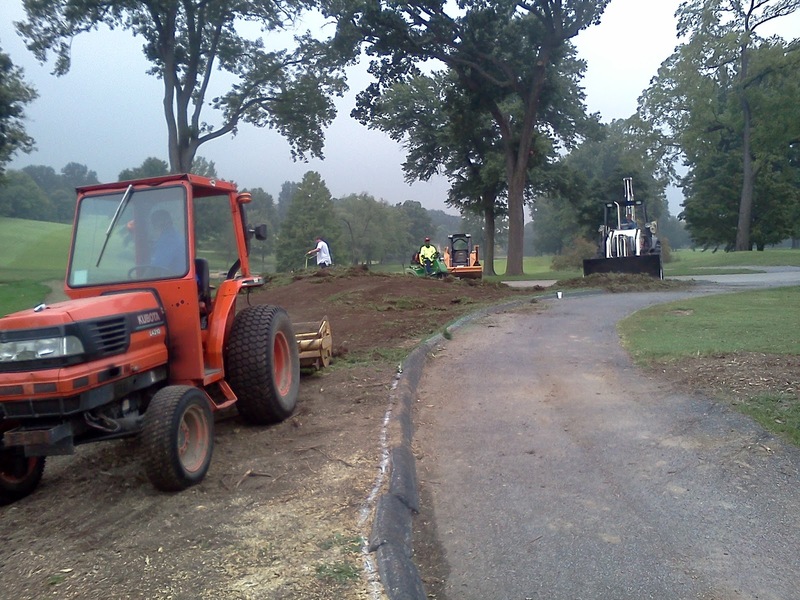 The staff pushed the sod into the bunker which makes it easier to use a skid steer to scoop it up and haul it out. The skid steer in the left bunker on #16. Sand was almost 2' deep. We used our backhoe loader on the right side which helps to load it into the dump truck. An older irrigation line running under the right bunker on #16. We have to dig out the line and cut it and place a cap on it outside the bunker. We assume it is still live. #16 complex cleaned and prepped, waiting for Kye Goalby to begin his work on Tuesday. 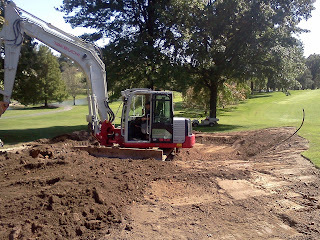 Tractor being used on #9 green to push sod into piles in preparation to be removed. #9 green with the sod removed around all the bunker and the back of the surround. Sand will be removed on Tuesday. I would expect Kye to begin work on Wednesday.